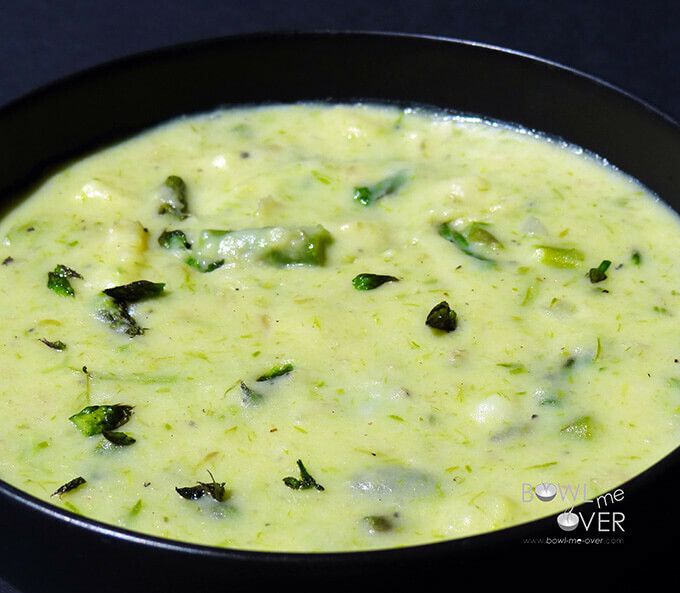 Vegetarian Asparagus Soup – All the cream with NONE of the guilt! Yukon gold potatoes gives this soup the creamiest texture but there’s no added cream. Perfect for using the delicious fresh asparagus at the farmer’s market, healthy and delicious! And on your table in about 30 minutes? Perfect! Love creamy soup but hate the calories? 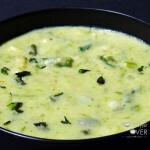 Vegetarian Asparagus Soup - Yukon gold potatoes give this soup the creamiest texture but there's no added cream. Start by roasting the asparagus - snap off the woody ends and reserve for vegetable stock or another use. Lay the asparagus spears on a cookie sheet and drizzle with 2 tablespoons olive oil, sprinkle with salt & pepper. Put in the preheated oven for 15 minutes, stirring once during roasting. Remove from oven, allow to cool. When cool, cut into 1" pieces, reserving the tops of the asparagus. While the asparagus is roasting, add one tablespoon olive oil to a large stockpot over medium heat. Add the potatoes, onions, celery and Parmesan cheese rind (if using shredded Parmesan, add it right before pureeing the soup), red pepper flakes 1 teaspoon salt and 1/2 teaspoon pepper. Cook the vegetables for about 5 minutes, until they begin to soften. Add in the vegetable stock (refrain adding additional salt until the end of the cooking process as the Parmesan cheese is quite salty). Increase the heat and bring it to a boil. Reduce it to a simmer and continue cooking until the potatoes are fork tender, about 20 minutes. Turn off the heat. Remove the Parmesan rind (it's job is done!). Add in the roasted asparagus (reserving the tops). Using a submersion blender, blend the soup until it is creamy. I like it not totally creamy, but still with some chunks in it as you can see it is pictured. When the consistency is to your liking add the asparagus tops back in the soup. Taste & adjust seasonings - you may need to add a bit of salt. Ya know, I just saw this on FB and had to comment about how creamy it looked. Now that I see the ingredients and that there is actually NO cream in it, I’m laughing at myself. Great job w/ this, clearly one would never know it wasn’t cream in there! Just printed this recipe to try! This looks so filling and tasty! What a beautiful soup. Asparagus is in season right now and it is perfect in soups. Love that there are potatoes in this! Thanks Rini, this is such a good soup, it’s really one of my favorites!